 Elevate your biscuits, like these kabocha sage biscuits. Here’s the recipe from Betty S. Liu. Simple oyster gravy. Here’s the recipe from Anson Mills. Put an egg on it (photo courtesy Pillsbury). 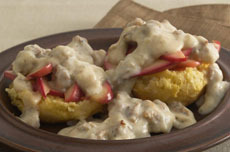 Surf and turf: oyster gravy over ham and biscuits (photo courtesy Pillsbury). Shucked oysters. 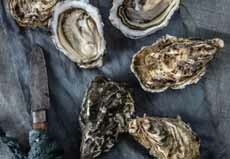 Your store may also sell a container of shucked oyster meats (photo courtesy The Spectator Hotel). Biscuits and gravy is a popular breakfast dish in the southern United States, a comfort food of biscuits smothered in sawmill or sausage gravy (see the different types of gravy, below). It’s a hearty gravy, made from the drippings of cooked pork sausage, white flour, milk, and often bits of sausage, bacon, ground beef or other meat. The meat gives heft to the dish as a main dish. Last year we featured biscuits and gravy as a Tip Of The Day. 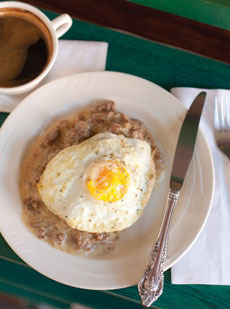 Check out a classic recipe and the history of biscuits and gravy. 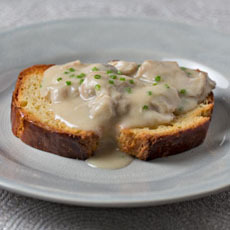 This week, Anson Mills sent us a recipe for oyster gravy on toast, using their local Sea Island oysters. It sure is an improvement on butter or jam. American shrimp and grits, bagels and lox, smoked salmon scramble (a.k.a. lox and eggs), and brunch dishes like seafood quiche or frittata and crab casserole and smoked salmon Eggs Benedict. British kedergee—smoked fish with rice and eggs (based on the Indian khichri, from the days of the Raj). Scandinavian smoked fish and pickled fish. Time out for an accolade: Anson Mills, founded by food visionary Glenn Roberts, has managed to reclaim America’s heirloom grains from oblivion. Bred for flavor, not for efficiency and profit, whatever products bear their name are the best of breed. If you want the best, or know someone who does, take a look. You’ll be overwhelmed at the riches, so be prepared to return. Says Glenn Roberts: “We won’t quibble with anyone outside our region over Southern ownership of gravy culture. But we will go to the mat defending the high art and undervalued virtues of seafood gravy. 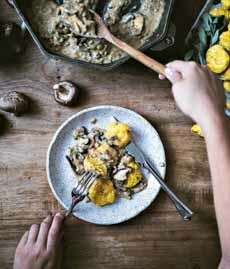 “…This recipe is really about secret ingredients within a lost cannon of Sea Island slave food culture: one from the big house larder, the other from hidden gardens. In his recipe, the deglazing liquid is white wine and the flour is added at the end, in the form of beurre manié (a mash of flour and butter). And, he serves the oyster gravy over toast (photo #2), in the manner of another old breakfast favorite, creamed chipped beef on toast. But biscuits are an easy substitute. As a first course at dinner. As a tea-time snack, instead of tea sandwiches. When you need some comfort food, more elegant than mac and cheese. Whenever life gives you a bounty of oysters. As surf-and-turf, topping a slice of ham on the biscuit. With specialty biscuits, like these sage and kabocha squash biscuits, or these dill biscuits with smoked salmon. The freshest ones! If you live on or near one of the coasts, ask for the best. Size doesn’t matter since you’ll be quartering them. Any plump, briny-aroma oysters will do. Anson Mills chose local oysters, but you can make seafood gravy with any fish or shellfish or snails. Or, order the best oysters, whole or already shucked, from Willapa Oysters. Fish gravies are parts of global cuisines from Indian fish curries to African fish gravy, a breakfast and dinner dish. TIP: You can add oysters or other seafood to a hearty mushroom gravy recipe. Gravy is a category of sauce made in its simplest form from flour (a thickener), fat (and pan drippings) from meat and poultry and seasonings (salt and pepper). Vegetables can be added, as well as wine and additional thickeners, such as cornstarch. The word originally referred to a sauce made from the drippings (fat and uses) from cooked meat and poultry, there are now vegetarian and vegan gravies, and gravies that add milk or buttermilk, even tomato. Jus (pronounced ZHOO), is the French term for a meat gravy that has been refined and condensed into a clear liquid. All gravies are sauces, but not all sauces are gravy. Brown gravy, made with the drippings from roasted meat or poultry. Cream gravy is the white gravy used in Biscuits and Gravy and Chicken Fried Steak. It is a béchamel sauce made with meat drippings and optionally, bits of mild sausage or chicken liver. Other names include country gravy, milk gravy, sawmill gravy, sausage gravy and white gravy. Egg gravy is a béchamel sauce that is served over biscuits, essentially cream gravy with a beaten egg whisked in. The egg creates small pieces in the gravy. Giblet gravy is a brown gravy that includes the giblets of turkey or chicken, and is served with those fowl. It is the traditional Thanksgiving gravy. Mushroom gravy is a brown or white gravy made with mushrooms. Red-eye gravy is a gravy made from the drippings of ham fried in a skillet, a Southern specialty served over biscuits, grits or ham. The pan is deglazed with coffee, and the gravy has no thickening agent. Vegetable gravy is a vegetarian gravy made with boiled or roasted vegetables plus vegetable stock, flour and fat. Wine and/or vegetable juice can be added. And let’s not forget our favorite dessert “gravy”: chocolate sauce, made with fat (butter), flour, cocoa powder and sugar. *A traditional Japanese breakfast is what Americans might order or dinner at a Japanese restaurant: rice, grilled fish, miso soup, pickles and a Japanese-style omelette (tamago). Here’s more information.